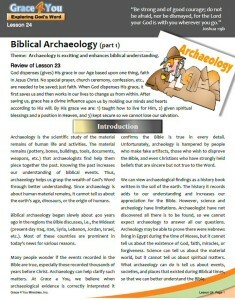 Lesson 24: Biblical Archaeology (Part 1) | Grace 4 You Ministries, Inc.
Archaeology is the scientific study of the material remains of human life and activities. The material remains (pottery, bones, buildings, tools, documents, weapons, etc.) that archaeologists find help them piece together the past. Knowing the past increases our understanding of biblical events. Thus, archaeology helps us grasp the wealth of God’s Word through better understanding. Since archaeology is about human material remains, it cannot tell us about the earth’s age, dinosaurs, or the origin of humans.